For advocates of space travel, the news is grim. In July, 2011, the last U.S. space shuttle was parked, as planned. Over 30 years, the shuttles helped build the International Space, but two explosions killed 14 astronauts, and each flight cost nearly half a billion dollars. 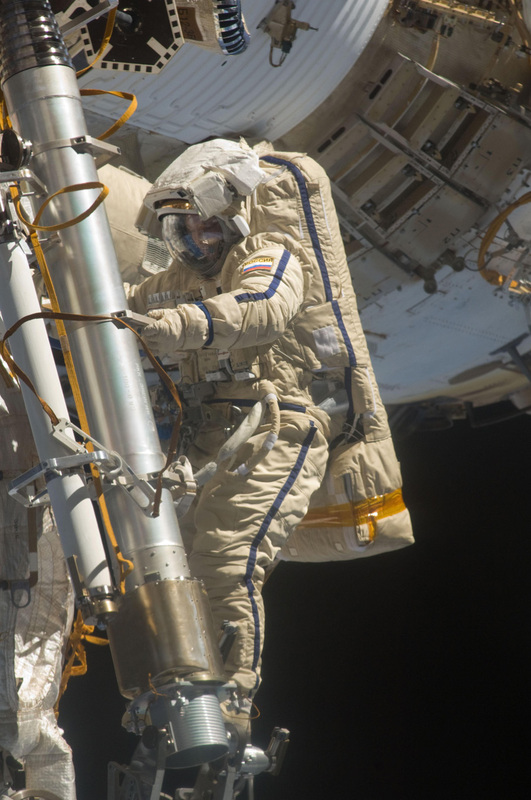 Russian cosmonaut Sergei Volkov takes a “walk” outside the International Space Station. Rocket failures and poor planning have imperiled our ability to populate the space station. 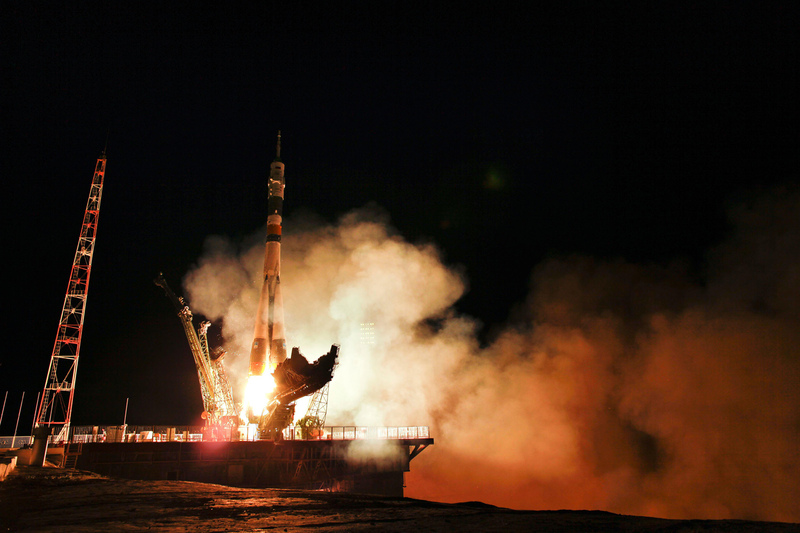 On August 24, 2011, a clogged pipe caused the crash of a Russian Soyuz rocket. Soyuz is a reliable space-truck whose ancestor launched Sputnik, the first artificial satellite, in 1957. With the shuttles in the old-age home, any delay of a Soyuz launch to resupply the space station, planned for Nov. 14, 2012, could force the station’s evacuation. June 8, 2001, NASA/Carla Cioffi. Soyuz takes off from Kazakhstan, carrying Russian, American and Japanese astronauts. The growing problem of getting into space got more attention on Aug. 24, when a sub-orbital space taxi built by Blue Origin, a company funded by Amazon founder Jeff Bezos, crashed in West Texas, setting back the nascent space-tourism industry. People have been going into space for 40 years, but the process is neither cheap nor routine. For comparison, 40 years after the first automobiles, millions of cars were changing the U.S. economy and landscape. And 40 years after Kitty Hawk (1903), airplanes had circled the globe and become a dominant force in World War II. So, 40 years after Yuri Gargarin became the first space-farer, why is it so hard to get people into space? The first clue to the difficulty of reaching orbit is evident in the controlled explosion needed to launch anything: reaching orbit requires a speed of almost 18,000 miles per hour and overcoming gravity. 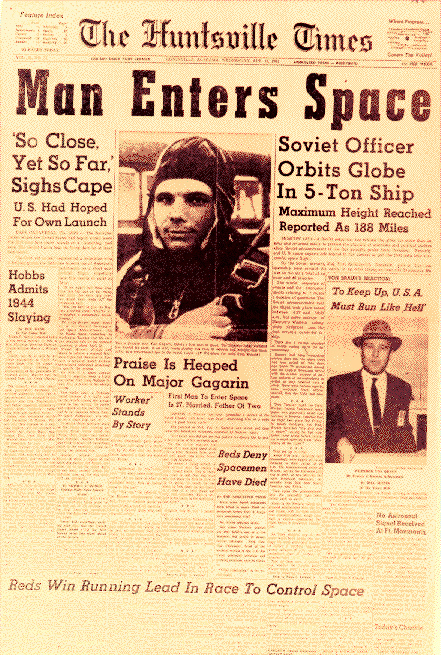 On April 12, 1961, Yuri Gagarin became the first person in space. The news stunned the world and spurred the struggling American space program. And gravity is a stern customer. Although gravity is fixed, a changing political backdrop has deprived the space program of its historic justification, says Howard McCurdy, a professor of public administration and policy at American University, and student of the space program. “The key problem, as a political scientist, was the end of the Cold War. Now the rationale for a lot of human space program is jobs, but in the absence of Cold War competition, we get these anomalies,” like thumbing a ride to space from your former enemy. The reaction to SLS was a bit ho-hum. The proposal “has been controversial because some say it’s just the same old technology, a combination of Apollo, Saturn V, and the shuttle, and we really should be advancing the technology, doing something new that will get us to deep space more quickly,” says astrophysicist Jack Burns, who has served on the NASA Advisory Council science committee, and is vice-president emeritus for academic affairs and research at the University of Colorado System. 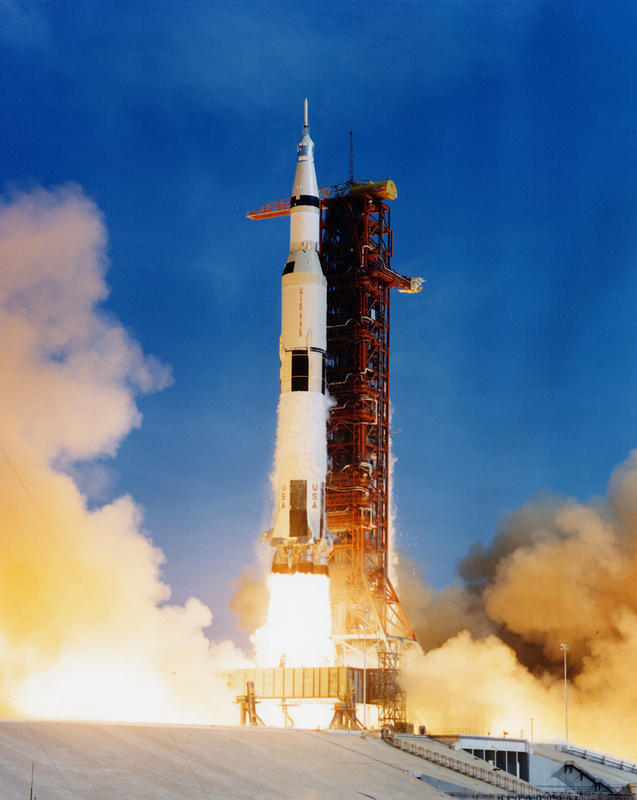 The Apollo 11 Saturn V space shuttle heads for the moon, carrying astronauts Neil Armstrong, Michael Collins and Edwin Aldrin Jr. The summer of ’69 will always be remembered for the first moonwalk. Getting to orbit didn’t turn out to be cheap: NASA chalks up the average price tag on 135 shuttle launches at $450 million. In 2005, faced with mission failures and an aging shuttle fleet, Pres. George W Bush called for the shuttle program to end after the space station was constructed. As a replacement, Bush proposed Constellation, a new rocket, and Ares, a new spaceship, which would visit the moon and then Mars. Who’d ‘a-thunk-it? 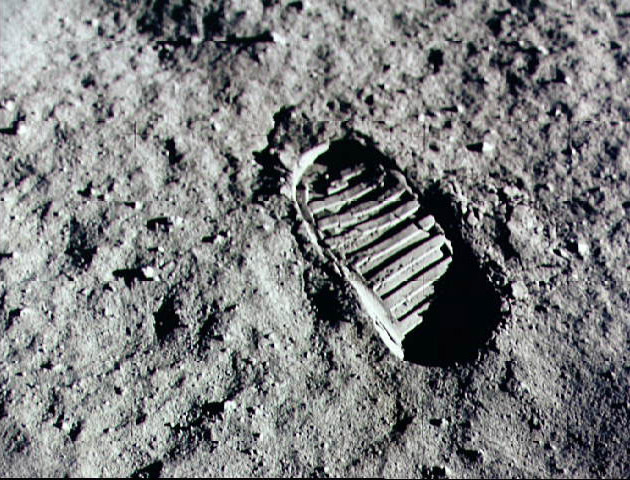 Footprints on the moon! Take the money and … design? Much engineering has been done for Constellation and previous rockets, and McCurdy, who acknowledges that the engineering and manufacturing expertise and the Saturn assembly line have long disappeared, wonders why NASA cannot produce a heavy-lift rocket for $50-billion. What are the other options for launching people into space? 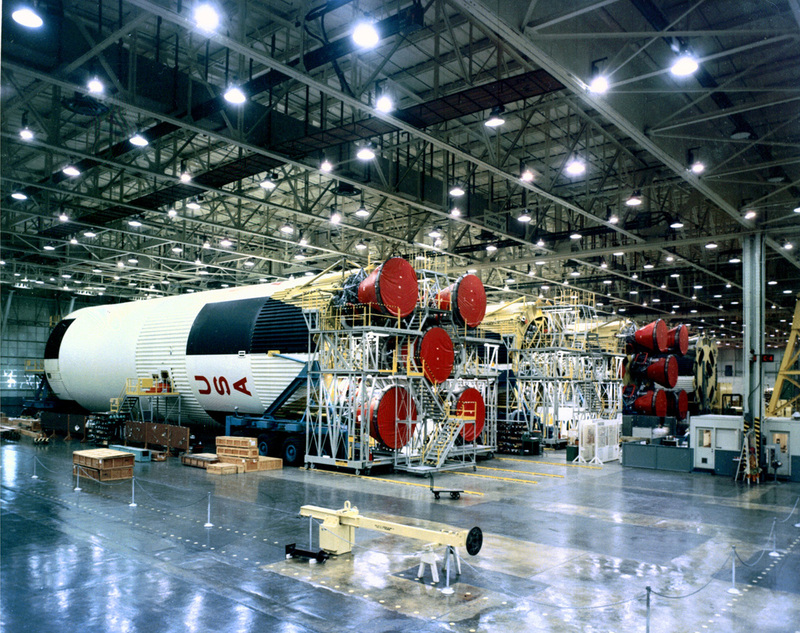 Saturn V rockets on the assembly line in 1968.
International rockets such as Ariane have gotten into the satellite-launch business, but most of them are not powerful enough to take people into orbit, or to leave earth orbit and reach the moon. China, with one satellite orbiting the moon, and an imminent launch of an 8.5 ton component for its first space station, definitely has the lift capacity, but we’ve not heard about any discussions about launching U.S. space equipment. So how is the private sector faring in the human space travel biz? SpaceShipOne, built by Scaled Composites, slung beneath White Knight, the mother ship that lifts it toward the edge of space. Blue Origin, a secretive operation funded by Jeff Bezos, the Amazon.com billionaire, is working on “New Shepard,” a sub-orbital vehicle. According to the website, “We’re working, patiently and step-by-step, to lower the cost of spaceflight so that many people can afford to go and so that we humans can better continue exploring the solar system. Accomplishing this mission will take a long time, and … we do not kid ourselves into thinking this will get easier as we go along.” Blue Origin has a NASA contract to develop a taxi for hauling astronauts to orbit, but recently lost a spaceship at 45,000 feet. 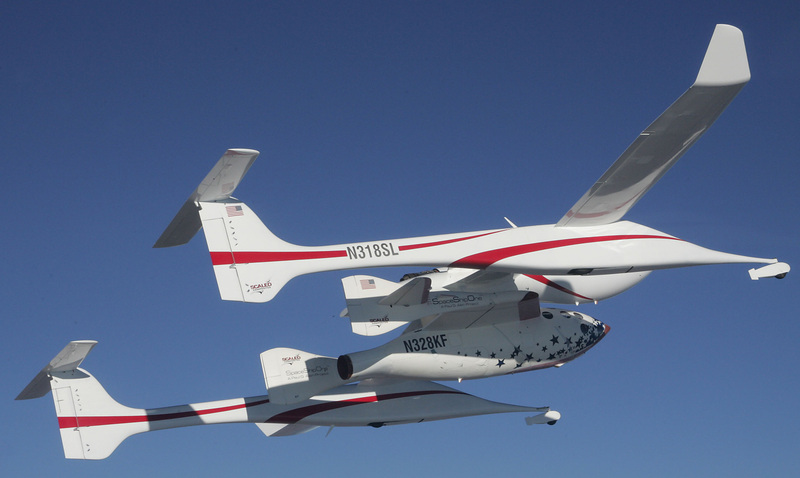 Scaled Composites, an advanced aircraft maker, won the $10-million X-prize in 2004 for attaining 328,000 feet twice within 10 days. The firm is working with Virgin Galactic to enhance its a sub-orbital spaceship-mother-ship combination. Virgin says 430 private-nauts are already put down a deposit for flights that will cost $200,000. Xcor Aerospace is also selling seats on an unfinished spaceship, for a suborbital flight priced at $95,000, starting with a spare-change deposit of $20,000. Buy now, and your seat-mate could be a Victoria’s Secret model… Honest! Let’s really go to space! Above the sub-orbital realm, however, comes the real high-technology interest: resupplying the space station, or reaching the moon or an asteroid. In this realm, one company has grabbed most of the headlines: SpaceX, founded by PayPal founder Elon Musk. 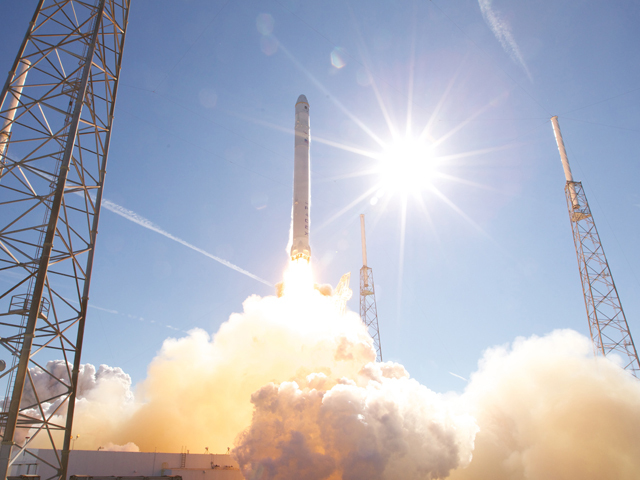 On Dec. 8, 2010, SpaceX launched a Dragon spacecraft on a Falcon 9 rocket from Cape Canaveral, and became the first firm to recover a spacecraft from orbit. SpaceX says it emphasizes reliability, and the business end of Falcon 9 houses nine individual rocket engines. The rocket is supposed to reach space even if one engine goes kaplooey. When President Ronald Reagan proposed and promoted what is now called the International Space Station, a howl went up among scientists who called it a diversion of resources from the more productive unmanned spacecraft. Carting people around raises the price and the stakes at every stage of design, production and operation, and these scientists accurately forecast a fruitful program of robotic exploration — everything from the Hubble Space Telescope, to the Opportunity and Sojourner rovers on Mars to the Galileo spaceship that explored Jupiter. The lonely robot Sojourner eyeballs a boulder on Mars. Roll over to see a snapshot by Sojourner’s rover-buddy Opportunity, taken on the promontory “Cape Verde” on Victoria Crater, Mars. The manned vs. robot argument had merit in its time, given that the space station alone has cost NASA north of $50 billion (with other countries contributing about the same amount), and NASA never has enough money for all the scientists who write grants, which leads some critics to question whether the money is well spent, or would have been more productive if spent on funding conventional science. 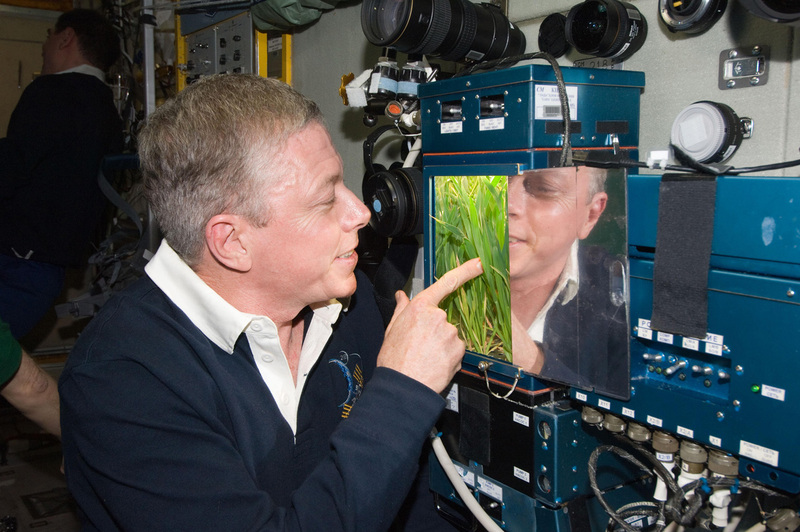 NASA astronaut Mike Fossum inspects a plant experiment on the space station. 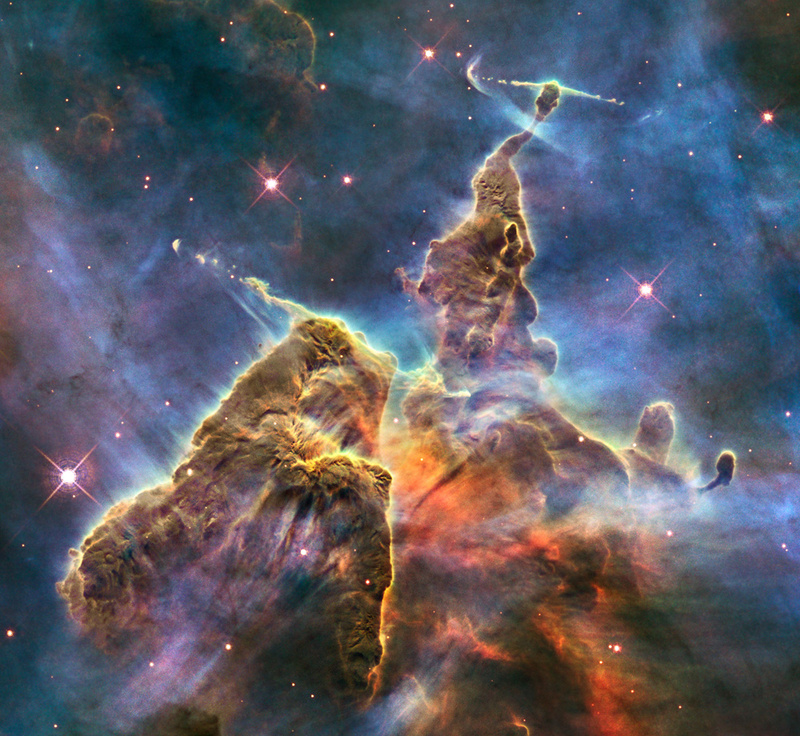 Hubble’s 20th anniversary image shows a mountain of dust and gas rising in the Carina Nebula. The top of a three-light-year tall pillar of cool hydrogen is being worn away by radiation from the nearby stars, while stars within the pillar unleash jets of streaming gas. Getting to orbit was neither easy nor routine in the 1950s: Just two months after the Soviet Union launched Sputnik, the first satellite, an American Vanguard rocket was blown to bits on the launch pad. Burns offers one suggestion for merging people and robots: sending astronauts to a low-gravity point above the far side of the moon (which never faces Earth), where they could control a moon rover. “Astronauts who are familiar with geological exploration could operate the rover in real time, there’s much less delay [in the radio signals]. They could visit the oldest [known] impact basin in the solar system, and it would not require a human lander, would be cheap, and would give you the kind of experience that is going to be needed” for further exploration of the solar system. Tele-operation, as remote-control is currently called, is being used every day by earthbound “pilots” in Nevada to fly drones in the Middle East, highlighting the firm link between space engineering and the military. Rockets and satellites have military roots, and the space race was an early and intense focus of Cold-War competition, as the United States and Soviet Union both relied on German rocketeers who had helped the Third Reich try to conquer Europe. Now the United States and Russia, World-War II allies, then Cold-War enemies, have become allies once again, at least in terms of space cooperation. 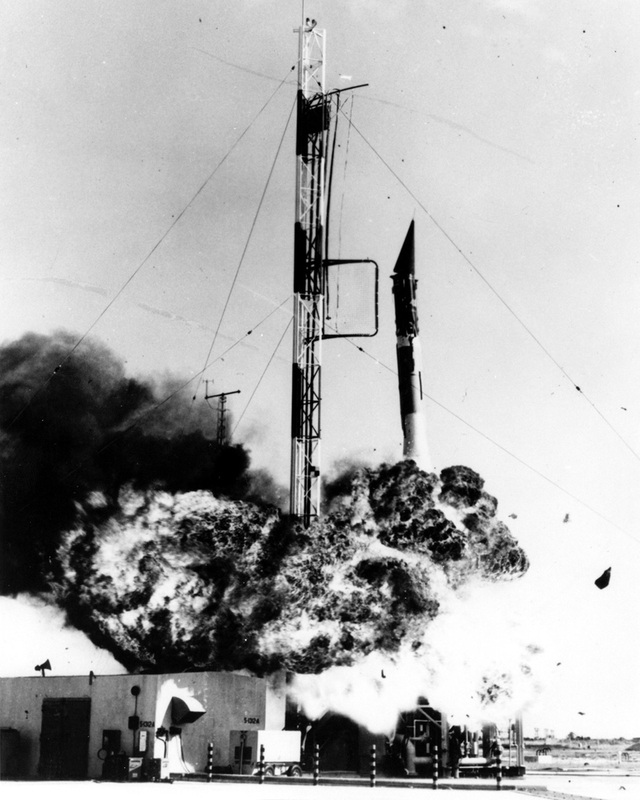 John F. Kennedy warned about a “missile gap” while running for president, and even though it proved illusory, the fear of Soviet supremacy — Sputnik was in orbit while American rockets were exploding in front of TV cameras — supported the development of missiles that could be used for global nuclear war or putting men on the moon. The result was lavish budgets for rockets and space. Space Science: By Human or Robot?